In other words, we’re often tempted to look for solutions where it’s easiest to look. Systems thinking challenges us to understand the problem more fully, and look for solutions at its roots. It helps us move the light source and find our keys! At Center for Health Progress, we’ve been using systems thinking concepts for awhile, but now we’re taking them on the road--right down Colfax Avenue to the state Capitol. The Legislative Health Equity Program is a pilot initiative that aims to center health equity in public policymaking. Chris Lyttle, our Senior Policy Manager, supported by a team of experts, will advise the House and Senate health committees, provide health equity training to legislators, and assist with analyzing the health equity impacts of health-related legislation. We’ll be working closely with Senator Fields, whose idea launched this program, and Representative Singer, as the chairs of the Health and Human Services Committees in their respective chambers. 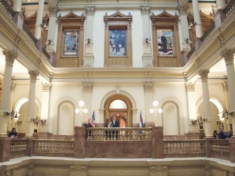 We’ll lean on the support of Pew Charitable Trusts, to help analyze bills and learn how similar initiatives have worked in other states, and the Colorado Health Institute, who will provide additional research and a health equity index for each bill. Using a tool based on one developed by the Health Equity Advocacy cohort of The Colorado Trust, we’ll analyze over 100 bills during the 2019 session, with the aim of advancing health equity in Colorado via the legislative process. After the session ends, we’ll release a report with some reflections on how this investment in health equity analysis affected the policymaking process. We’ll share some ideas for what worked well and any lessons we learned, as well as how this program could be expanded so every committee has access to equity advisers and every piece of legislation is analyzed to understand its health equity impacts. Our hope is that this program can be a model for other committees and even for other states. We know that the reason our health care system doesn’t work well for all Coloradans right now is at least partially because our system of laws and policies weren’t designed to work well for everyone. Transformative change is the kind of change that upends business as usual--or in this case, policymaking as usual--by introducing a new perspective or approach, and we think this program has the potential to be transformational. We’re excited to have so many great partners working together to bring systems thinking and health equity analysis to the Capitol, and can’t wait to see what new solutions we illuminate as a result of this work.